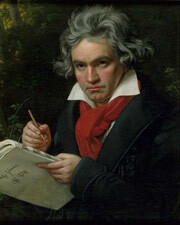 Lengthy books and countless articles have been written about the composer Ludwig van Beethoven. The stories, misconceptions, and alterations are many, but no matter how time has distorted information, some things are very clear when it comes to the subject. He was named after his grandfather who had held a prominent music position, and young Ludwig's talents were discovered fairly early in his life. Sources vary in how mean and pushy his father was in trying to exploit his child's talents, but it's well-known that Ludwig could stand in as organist for his teacher before he was yet a teenager, and it's also documented that he was the main breadwinner of the family from very early on. Beethoven's father suffered from alcoholism which only grew worse, and when his mother died when he was just 16, he wrote a letter to his father's employer asking that the salary be paid to him. From that point on he essentially raised his two younger brothers while still tending to his music studies and job as a musician in the string section. Several years after his first attempt at going to Vienna, the music capital of the world, Beethoven attempted one more time. The first time he had visited the city an urgent telegram about his mother's death called him home shortly after his arrival, thus foiling his hopes of, amongst other things, studying with Mozart. The second time became very different. He settled and in a few years established himself as the leading virtuoso and improviser at the piano in all of Vienna. Instead of seeking out permanent employment at churches and courts he worked as a freelancer, arranging concerts and dedicating compositions to his patrons so he could make a living. In his mid-to-late twenties he started getting uncomfortable feelings in his ears and was prone to illness. After some back and forth with various doctors, the prognosis he received made him contemplate suicide. The discomfort in his ears was only going to get worse, and eventually he would be left without any notable hearing at all. The prospect of going deaf troubled Beethoven so much that he wrote a will which has survived to this day. He later resolved to living, stating that despite all bodily weakness his spirit should rule, and that he felt he could not let go until everything in his heart had come out. When he could no longer keep his ailment a secret, people were keen to disbelieve that he could still compose music, but his output only continued to improve, and many of his masterpieces were written when he had no hearing at all. In the last 15 or so years of his life he was dependent on people writing down their conversation to him. Beethoven's love life was another sad matter. He fell in love a few times, but it was usually with unavailable or unattainable women from the high society who would end up marrying a person from their own class. Musicians were considered mere workers and beneath the aristocracy, even despite success. One example is with the famous Moonlight Sonata, dedicated to a young countess who studied under him for a while. She later married a count and moved to Italy. Another example is one of history's big love-mysteries. After Beethoven's death in 1827 a letter was found amongst his belongings addressed only to his immortal beloved. It has been unclear who could possibly have been the recipient of the tender content within, and many guesses and theories have been proposed pretty much ever since the discovery. In recent years some scholars seem to be leaning towards a woman named Bettina Brentano von Arnim. Beethoven's funeral made thousands of people flock to the streets, but much more importantly he left behind a legacy of music that, in my opinion, has yet to be surpassed.